The moment you found out a baby is coming, your whole attitude towards (what used to be) ordinary things and situations changes. You uncontrollably start to plan things out and become more careful with everything that surrounds you and your family because, of course, all things have to be perfect after your little bundle of joy arrives home. Your house needs to be clean, your baby’s room has to be perfect, you must have easy access to everything you and your baby need (in order to take good care of him) and try to remove every reason for concern. Fore some expecting parents, having a pet (especially a dog) is actually a thing that really worries them. They usually start asking themselves questions like: “Should we get rid of the dog?” or “OMG! What if our dog licks or, even worse, bites the baby?”. Well, all these questions are, indeed, justified, but before you take any action, you should first inform yourself about what could you do best in this situation. A dog is part of the family and in the majority of cases it is seen as a child by his owners they can have a yorkie that they love and follow a guide to food for your Yorkie. So, getting rid of it will certainly be heart-breaking. Fortunately, there is no need to do this when you’re about to have a baby. Just take into consideration the following basic things and start preparing as soon as you found out a new family member is on his way. Dogs tend to be anxious when their lifestyle unexpectedly alters. This is why you should try to your dog’s stress by slowly getting it used to the changes in advance. Below are some preparations you should consider making before bringing your baby home. Good Dog, Happy Baby: Preparing Your Dog for the Arrival of Your Child, by Michael Wombacher is a must-read on this subject. I also warmly recommend Tell Your Dog You’re Pregnant: An Essential Guide for Dog Owners Who Are Expecting a Baby, by Dr. Lewis Kirkham. Make sure you find a cozy, quiet place in the house for it to retreat when he feels overwhelmed or overstimulated because of the baby’s crying or the general bustle around the newborn. The place must be comfortable and it should make your dog feel safe. Make sure you put there a bowl of water, a bowl for his food, some treats and its favourite toys. You should be able to control your dog as much as possible, so teach your dog you are the leader (if it doesn’t already know it). Begin with basic obedience skills training, like ‘sit’, ‘stay’, ‘down’. These skills will come in very handy after you bring your baby home. Then move on to ‘go away’ or play fetch. This will enable you to control its movements and interactions with your baby. Start gradually with preparing your dog for a less strict schedule. Try to feed it and go for walks or at different hours each day. You won’t be able to maintain a daily routine, at least not during the first months after your baby is born. So, changing your dog’s daily routine, too, will be the best practice. If your dog has a lot of freedom around the house and you let it sit or sleep on the couch, in your bed, you allow it to enter every room of your home or jump on the furniture, you should slowly try to change the way it behaves by making new rules for it to obey. Introduce it to restrictions, one at a time, in a gentle manner. 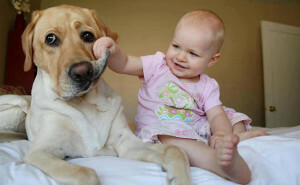 You don’t want your dog jumping near your baby, accidently scratch him or fetching your little one’s toys. If you don’t want your dog to get inside the nursery, try placing a physical limit at the entrance of the room, like a walk thru gate, and help your dog get used to it. Before your baby gets home, unpack some baby items and let your dog get used to them. Allow your dog to smell and investigate them, but correct its behaviour if it grabs the objects. Let it smell baby cream, powder, diapers (even if not used) and play real baby noises to get it used to baby smells and sounds. It is also recommended to simulate your behaviour and activities around the baby by using a baby doll. Let your dog watch you and correct its behaviour if necessary. Although it may seem a lot of difficult work, preparing your dog for the arrival of your newborn is not as difficult to achieve as it seems. Dogs are really smart pets, so you just need a bit of patience and some free time to teach yours the new rules. How did your dog’s first encounter with your newborn baby go?